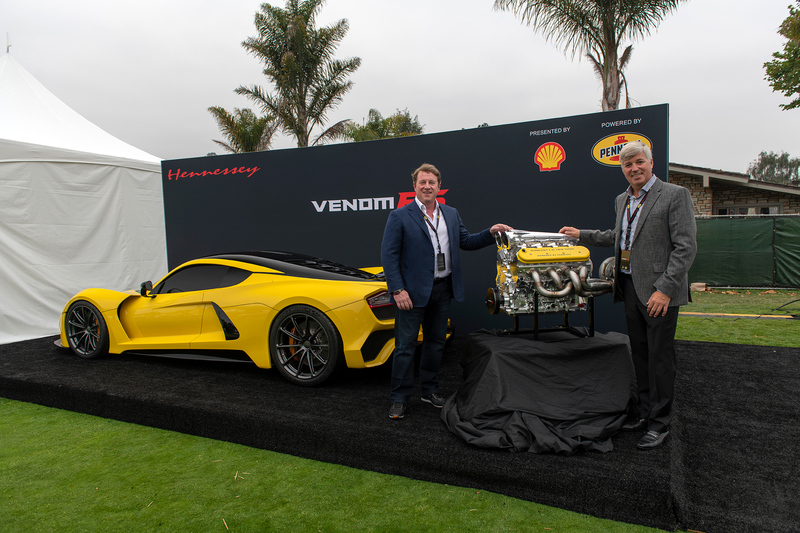 Pebble Beach – Shell and Pennzoil teamed up with Hennessey Special Vehicles to bring the Hennessey Venom F5 to The Quail, A Motorsports Gathering, to unveil much sought-after engine details since its first industry introduction last fall. 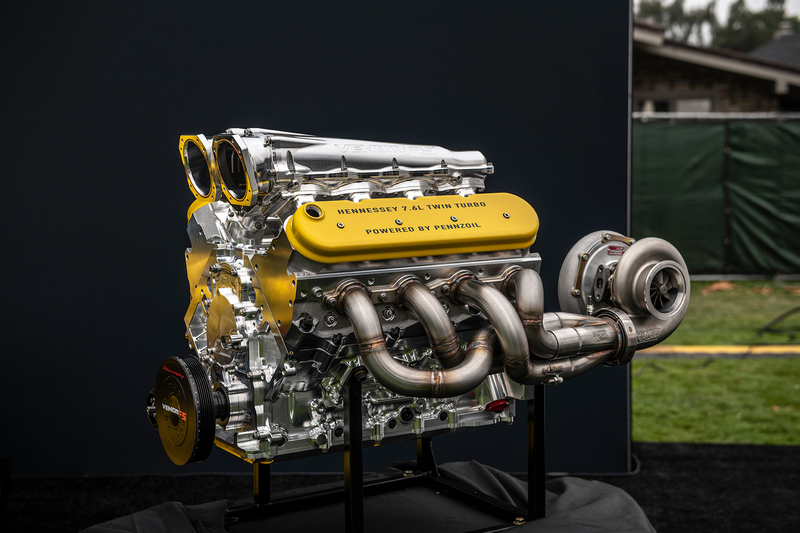 In addition to the ample horsepower available to the Venom F5, the hypercar’s engine is a billet aluminum machined engine block with steel cylinder sleeves that will continue to push the envelope with 1,300 lb-ft torque @ 4,400 rpm, a 9.3:1 compression ratio, and features precision ball bearing twin turbos with billet compressor wheels, stainless steel turbo headers, and a dry sump oiling system. 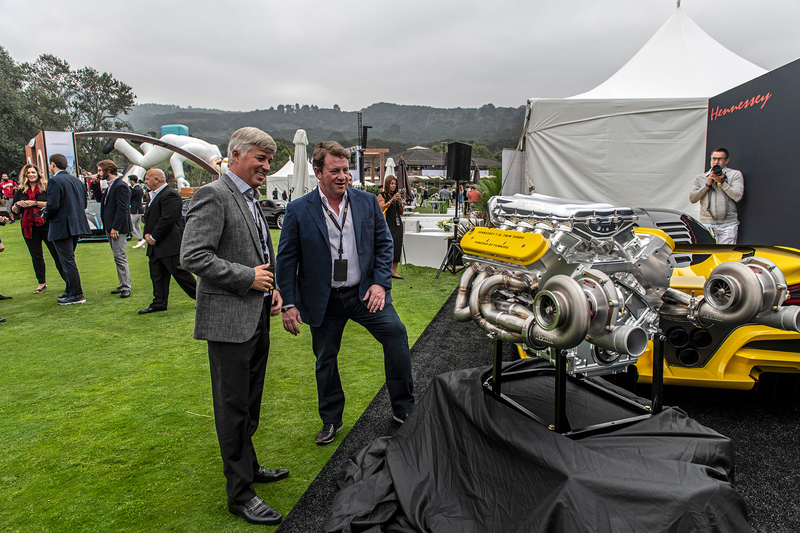 For nearly five years, Shell and Pennzoil have been working with Hennessey founder and CEO, John Hennessey, to power and protect his coveted asphalt-eating power machines. 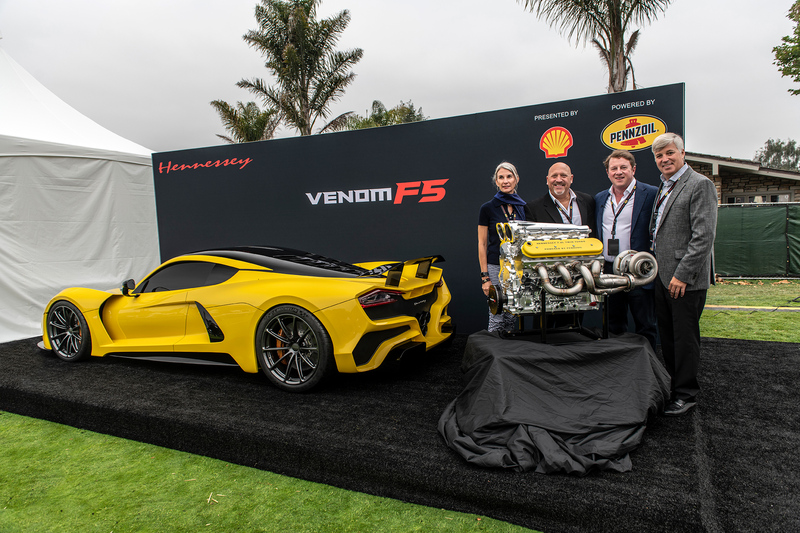 More than two years ago, they joined up to co-engineer a vehicle that is on pace to re-write the industry record books: the Venom F5. 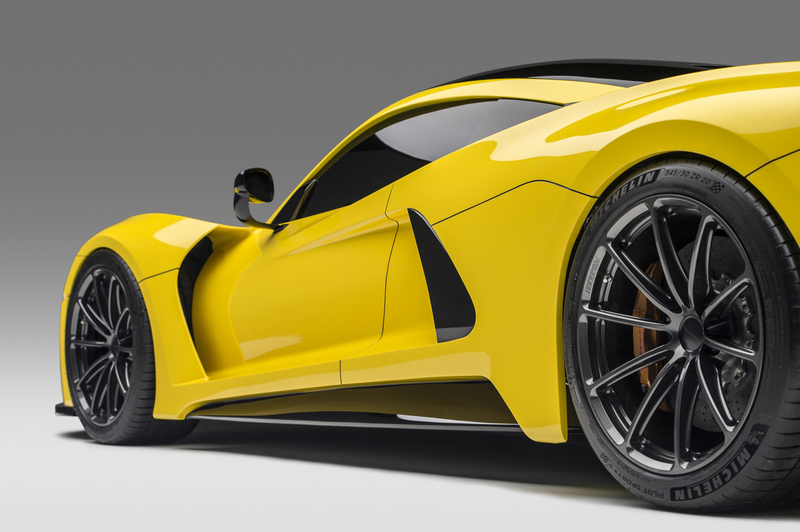 This extreme hypercar has been designed and built with the goal of being the fastest car on earth. 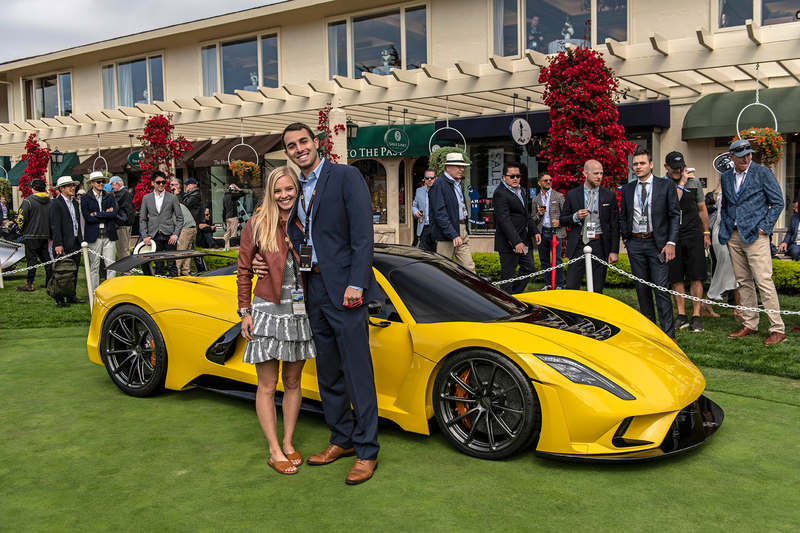 “Our relationship with John and the Hennessey Special Vehicles team is mutually rewarding. 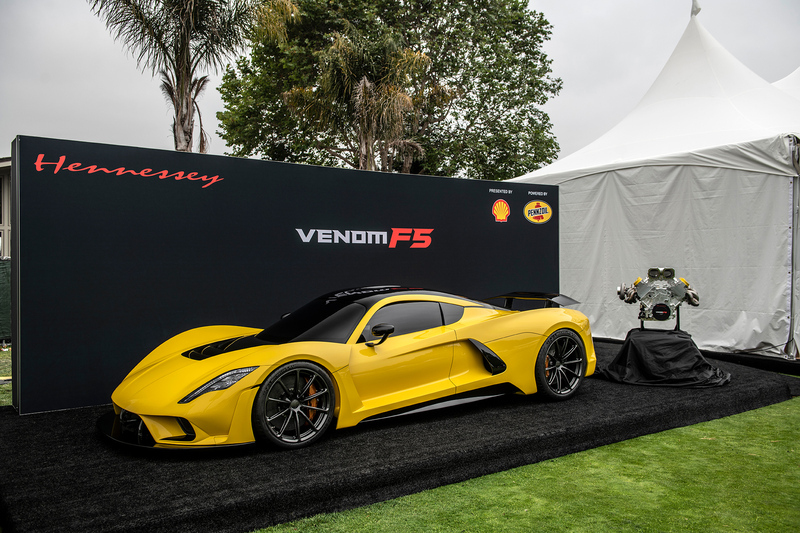 Our products are tested to their performance limits in the new engine designed especially for Venom F5 and will help the Hennessey team to break more records. 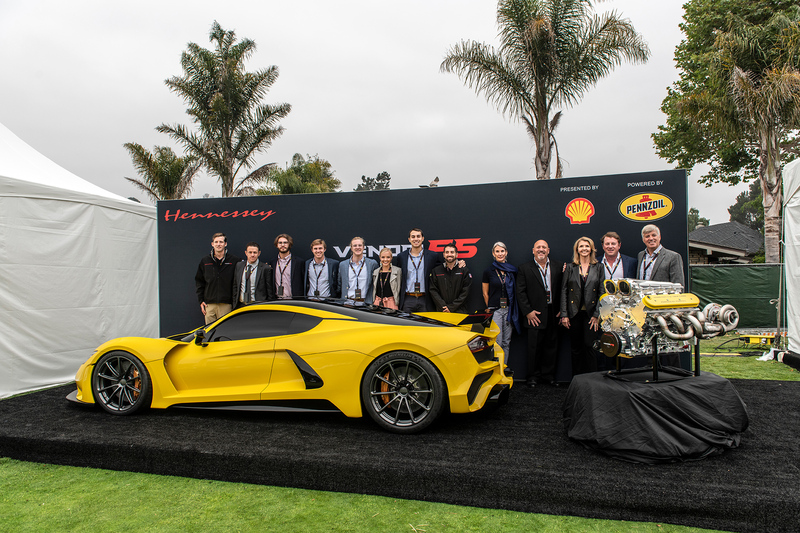 This extreme performance testbed allows Shell to progress our own innovations as we support this hypercar in its move to next level status,’’ said Carlos Maurer, president, Shell Lubricants Americas. 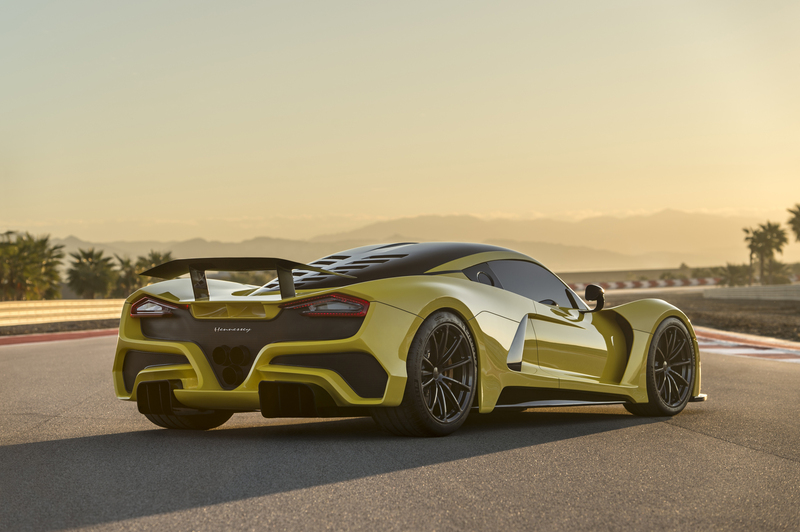 The Venom F5’s bespoke design and chassis will also help achieve even greater performance through improved aerodynamics and technology. 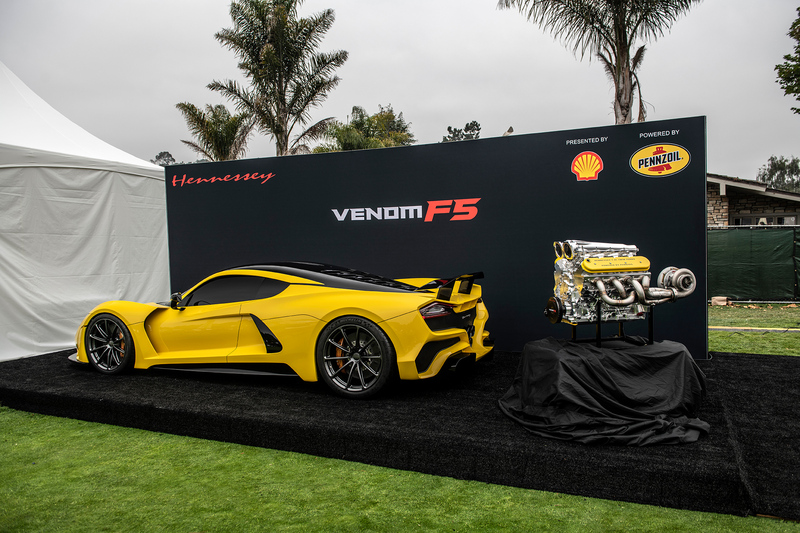 Hennessey will rely on Pennzoil Platinum 10W-60 Full Synthetic motor oil and Shell V-Power® NiTRO+ Premium Gasoline to protect and power the Venom F5 across any finish line. 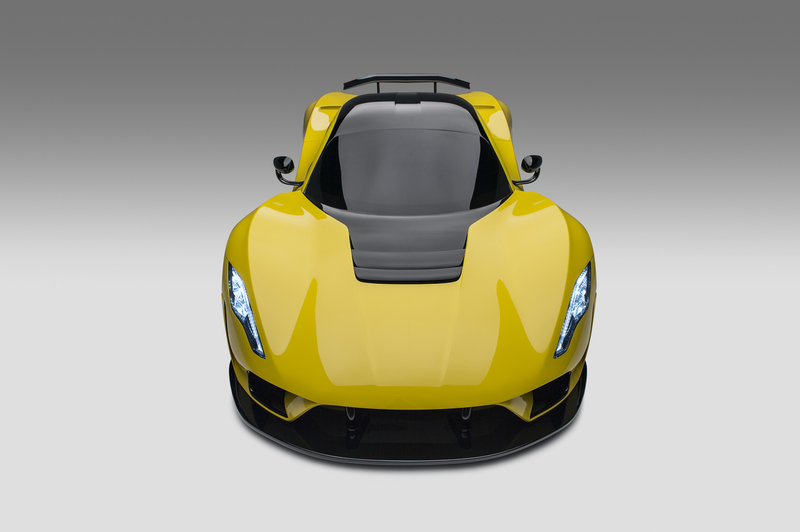 Out of the 24 vehicles that will be built, there have already been 15 confirmed orders. 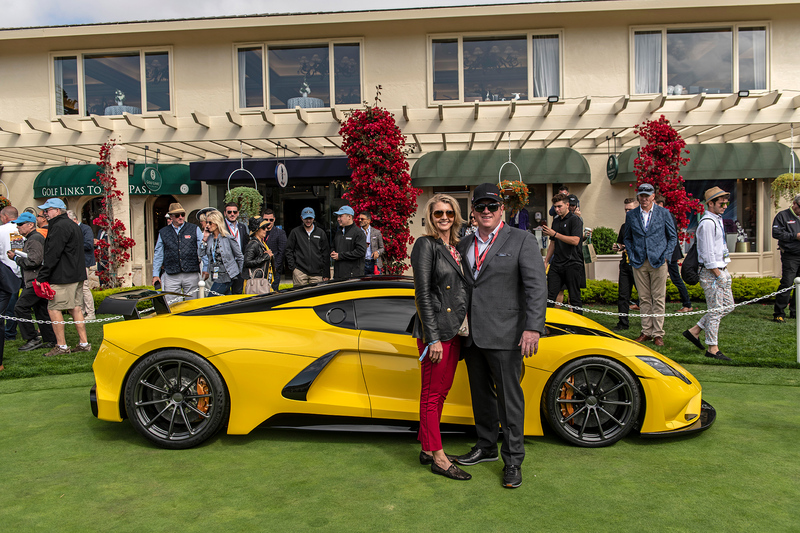 John & Hope Hennessey on the concept car green in front of The Lodge at Pebble Beach. 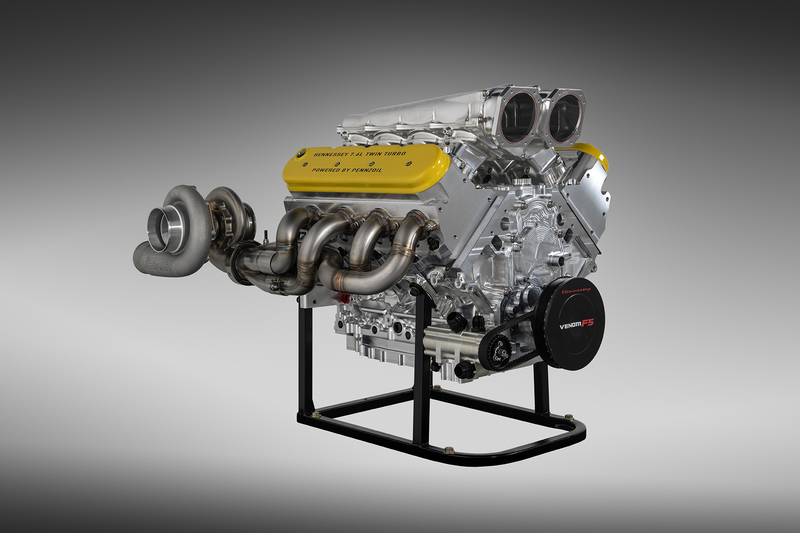 1600 bhp Hennessey Twin Turbo V8 Engine | Top speed: 301 mph | 0-186 mph: < 10 sec. 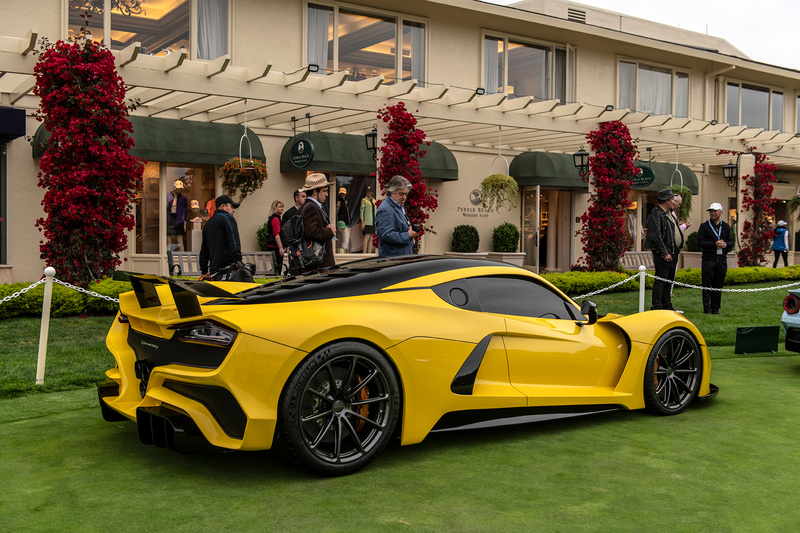 | 0-249 mph-0: < 30 sec. Las Vegas, NV and Sealy, TX – November 1, 2017. 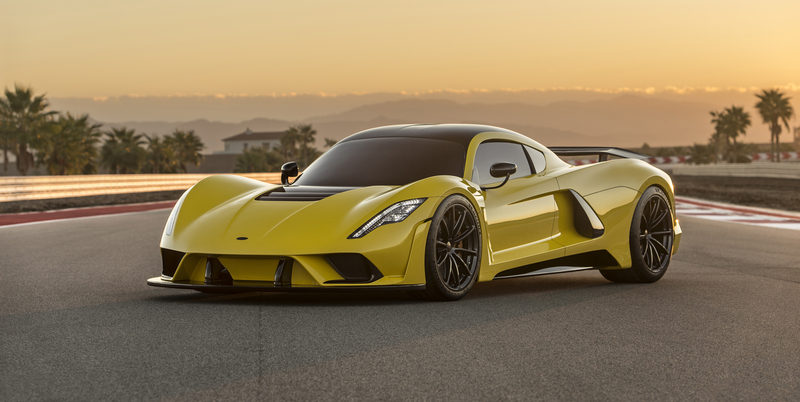 Today at the Shell “Pioneering Performance” experience at the 2017 SEMA Show in Las Vegas, NV, John Hennessey of Hennessey Special Vehicles will unveil the much-anticipated Venom F5. 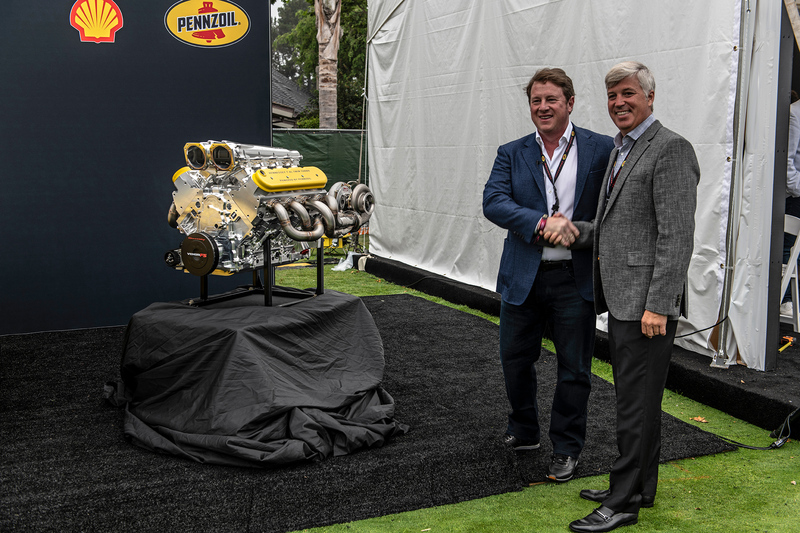 Together, Shell, Pennzoil and Hennessey have broken barriers, set records and now they’ve co-engineered the next big thing in the automotive industry - and that’s still just the beginning. 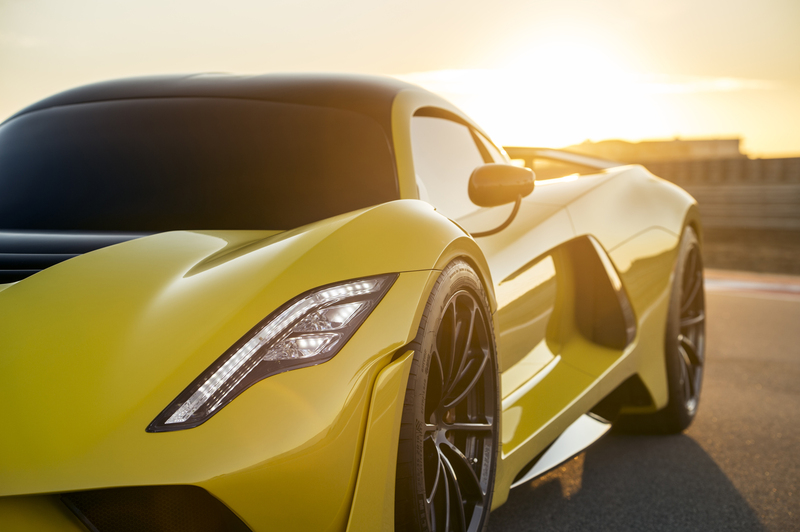 The Venom F5 is an all-new hypercar designed and built from the ground up with one goal in mind: To be the absolute fastest road car on earth. 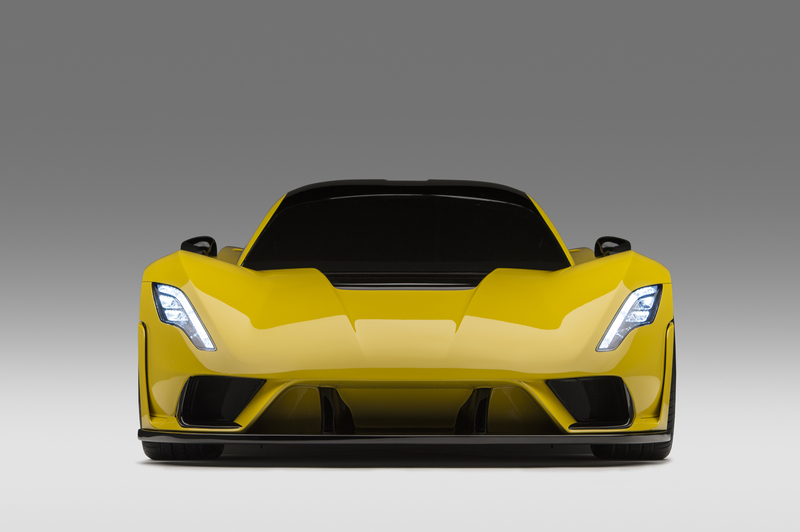 Hennessey and team have developed a completely new design, chassis and carbon fiber body focused on aerodynamics to achieve the lowest possible drag. 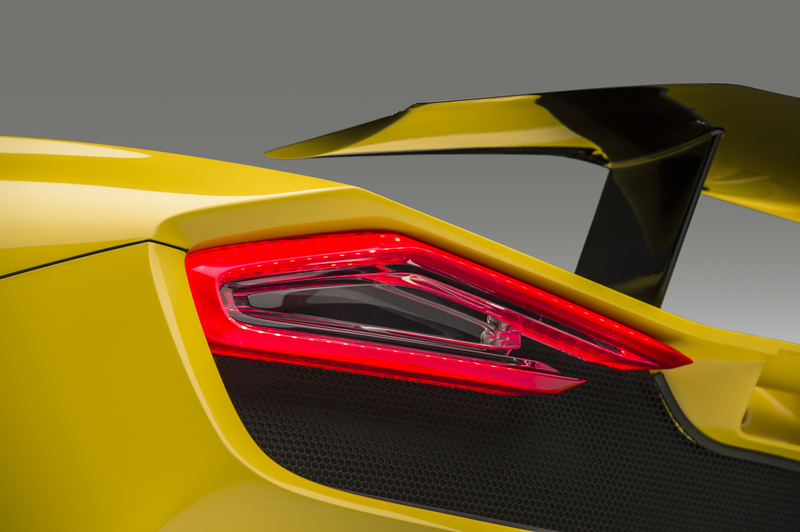 The new F5 design features active aero that will yield a coefficient of drag of just 0.33. 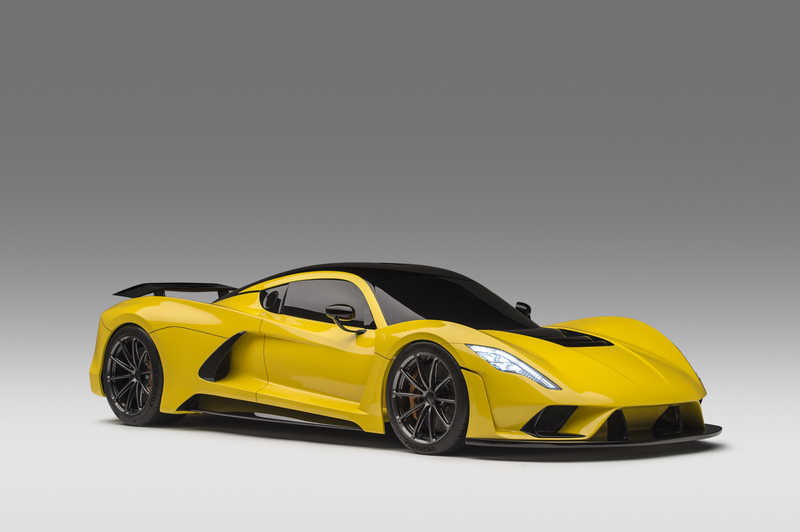 The Hennessey team is developing an all new, twin turbo V8 engine that will deliver over 1600 bhp. 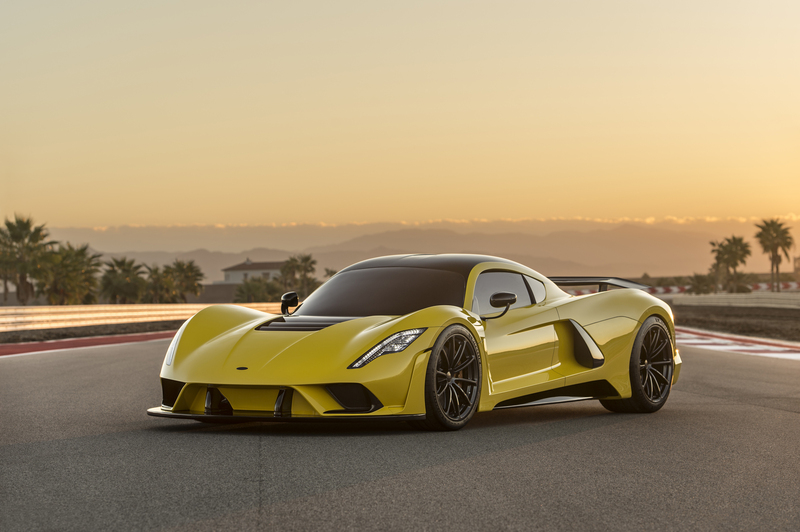 The Hennessey engine will be mated to a 7-speed single clutch paddle shift transmission and delivering power down to the rear tires. 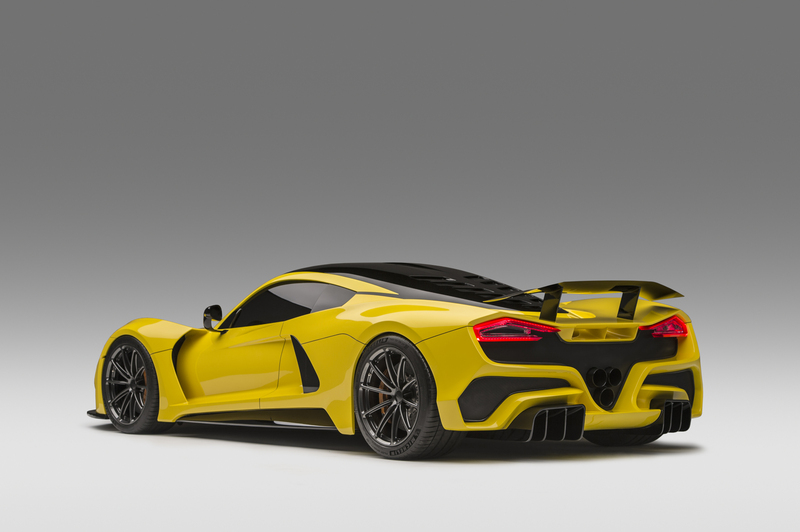 The Venom will also feature an all new light weight chassis and all carbon fiber body, which will give the F5 a curb weight of 2,950 lbs. 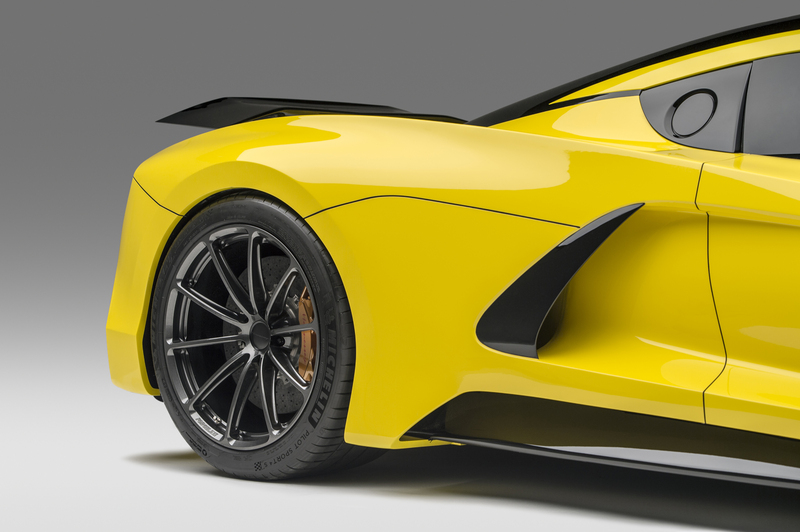 The F5’s combination of light weight, low drag and all-American horsepower will deliver a new level of hypercar performance. 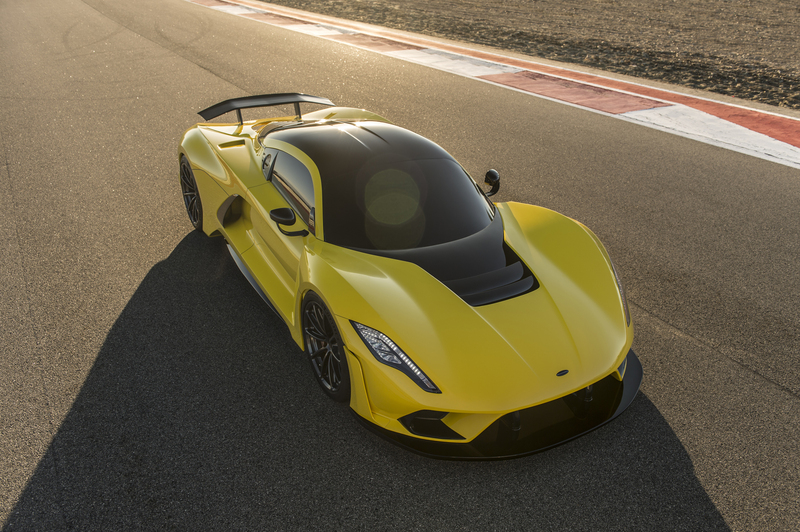 Acceleration from 0 to 186 mph (300 km/h) will be less than 10 seconds making the new Venom quicker than current Formula 1 race cars. 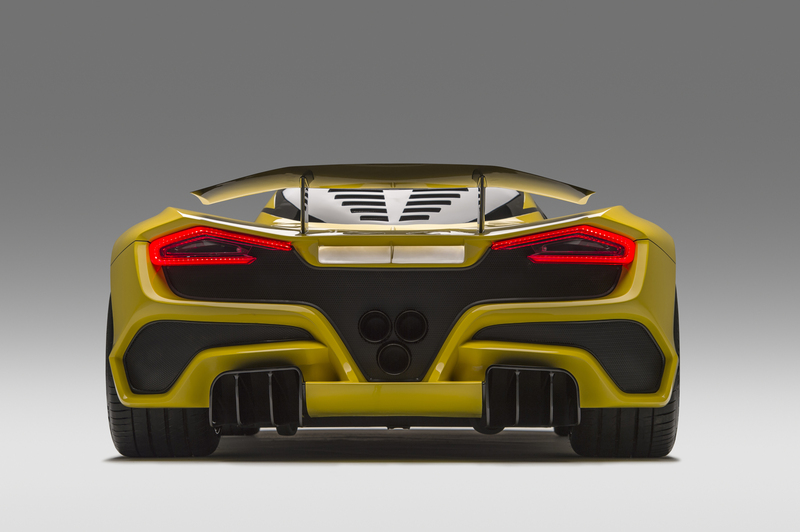 Zero to 249 mph (400 km/h) and back to rest will be under 30 seconds. 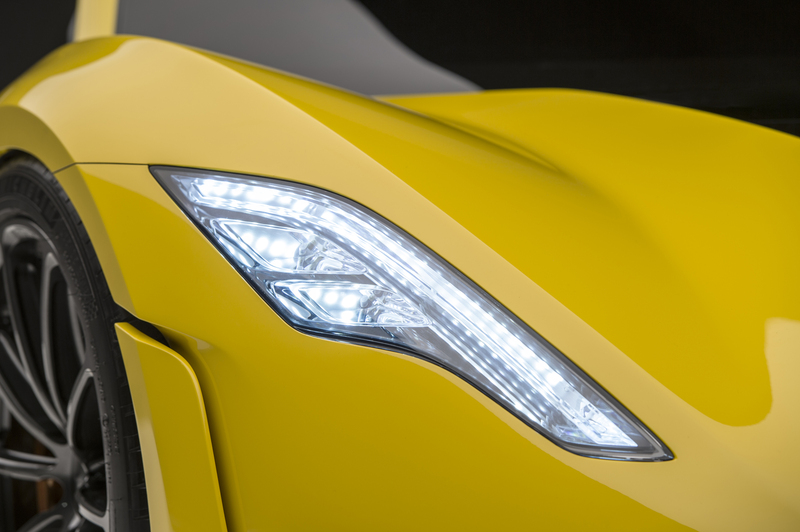 The top speed of the Venom F5 is projected to exceed 300 mph. 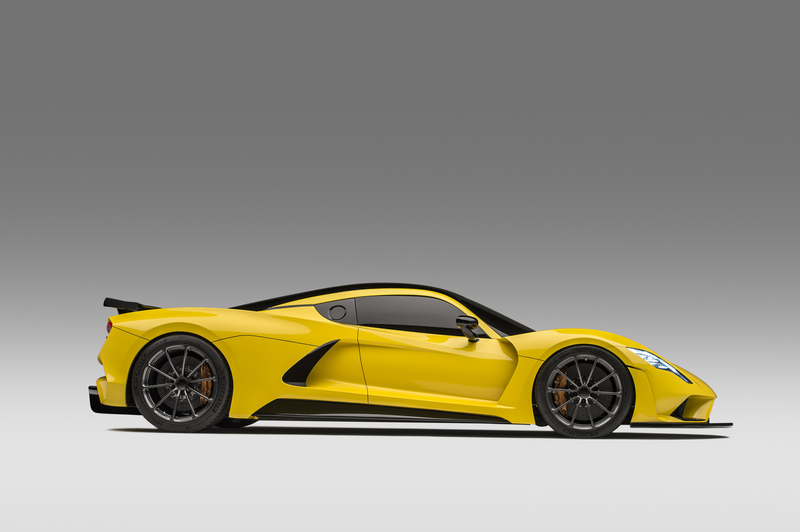 The base price for the Venom F5 is $1.6 million US dollars. The company plans to build 24 examples. 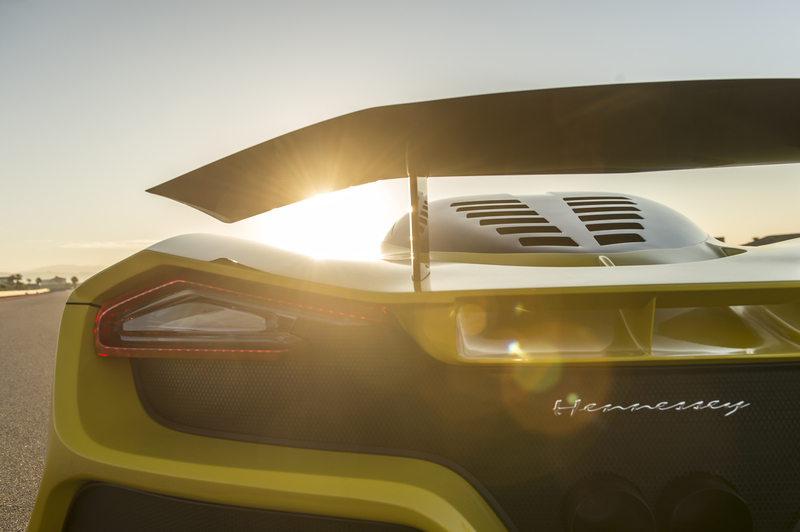 In addition to having Pennzoil coursing through the F5 engine, it protects engines in every Hennessey build. 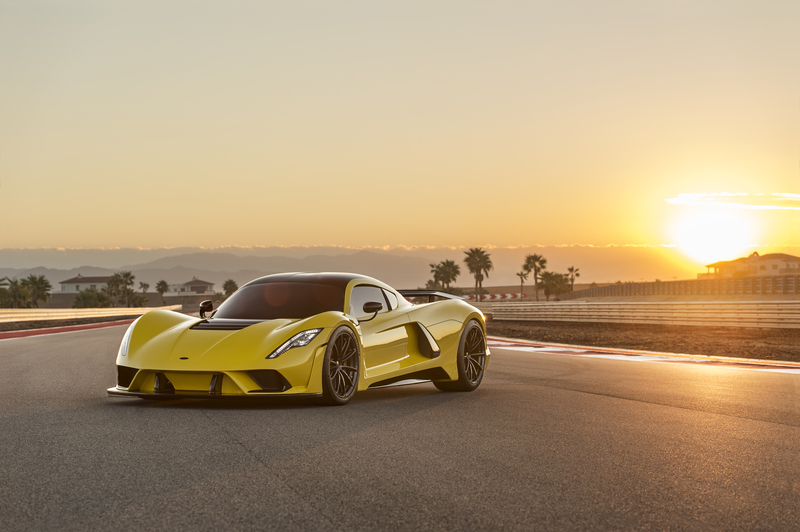 Hennessey also relies on Shell V-Power NiTRO+ Premium Gasoline to fuel each of their powerhouses from the test track to the road. 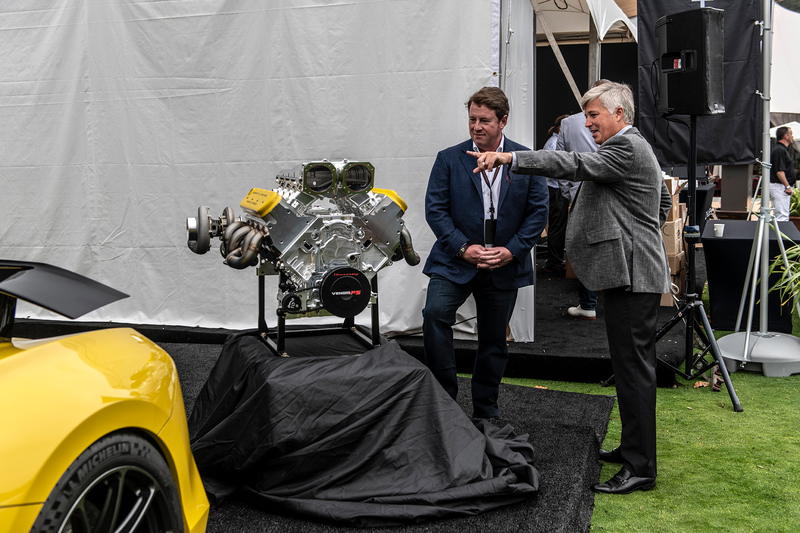 John Hennessey has put his pioneering excellence on full display at the Shell “Pioneering Performance” experience for the remainder of the week at the 2017 SEMA Show. 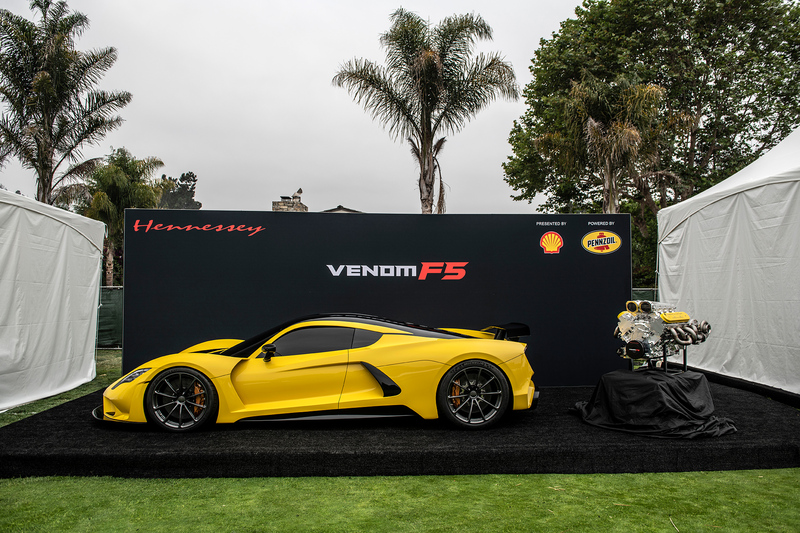 In addition to the Venom F5, Hennessey also brought along the Hennessey VelociRaptor 6X6 and THE EXORCIST TM, based on the 2018 Chevrolet Camaro ZL1. 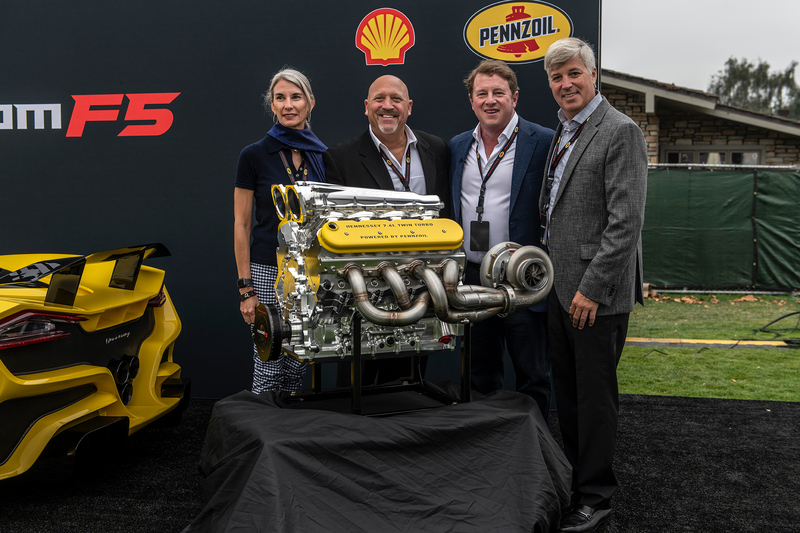 Follow all the action and updates on social media via #ShellatSEMA and check out www.shell.us/sema for a full schedule of events at the Shell “Pioneering Performance” experience and Live Stage. 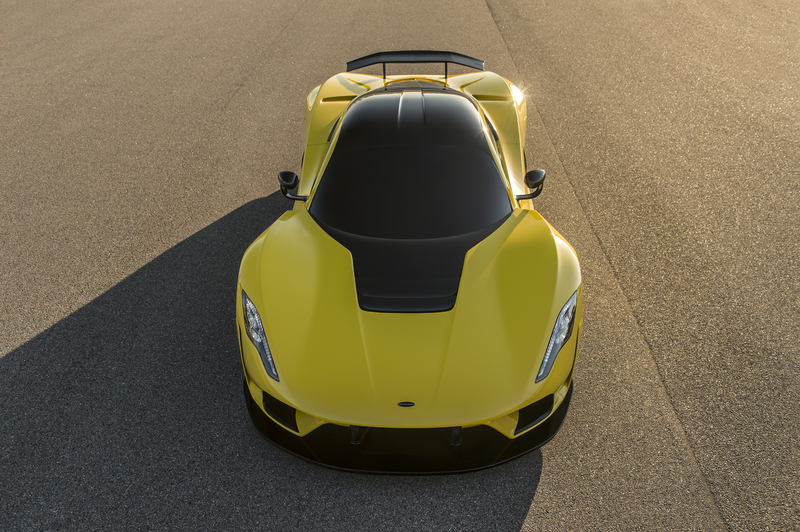 About Pennzoil® At Pennzoil, we’re car people. We love cars and the role they play in our lives. That’s why we tirelessly strive to produce the most technologically advanced, highest performing motor oils on the market. 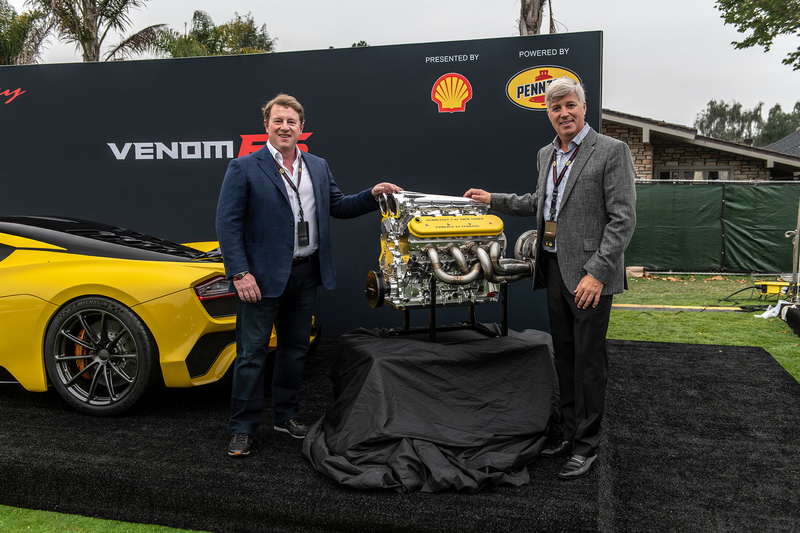 Pennzoil has made the switch to natural gas technology to make purer synthetic motor oils that lead to better performance than motor oils made from crude oil. 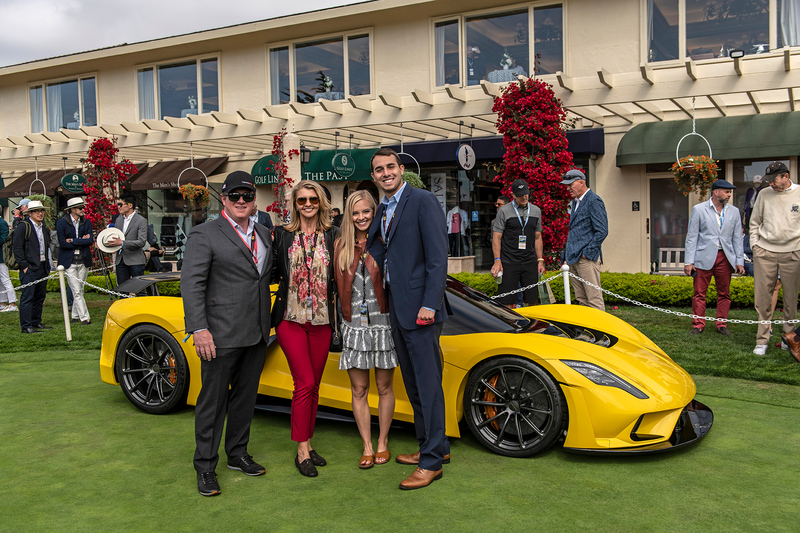 Every bottle of Pennzoil Platinum®, Pennzoil Ultra Platinum™ and Pennzoil Platinum® High Mileage Full Synthetic motor oil is formulated with PurePlus® Technology. PurePlus® Technology is the revolutionary process, which converts natural gas into high quality full synthetic base oil, with fewer impurities than traditional base oils made from crude oil. Feel the difference of next level performance. Make the switch. Pennzoil® is the most trusted motor oil brand in America. * The full line of Pennzoil® quality products includes Pennzoil Platinum® Full Synthetic motor oil, Pennzoil Ultra Platinum™ Full Synthetic motor oil, Pennzoil Platinum® High Mileage Full Synthetic motor oil, Pennzoil Platinum® Euro Full Synthetic motor oil, Pennzoil Gold™ motor oil, Pennzoil® High Mileage Vehicle® motor oil, Pennzoil® motor oil, and Pennzoil Marine® engine oil. 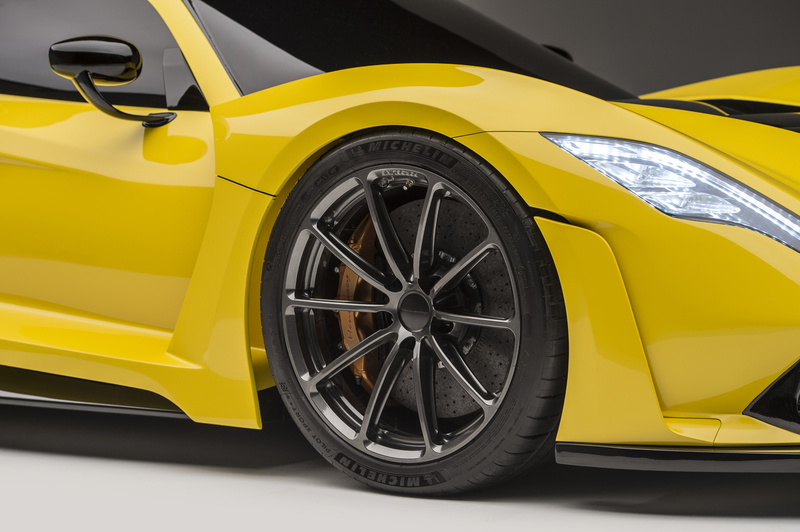 For more information about the full line of Pennzoil® lubricating products, motor oils and filters, please visit www.pennzoil.com. Not just oil. 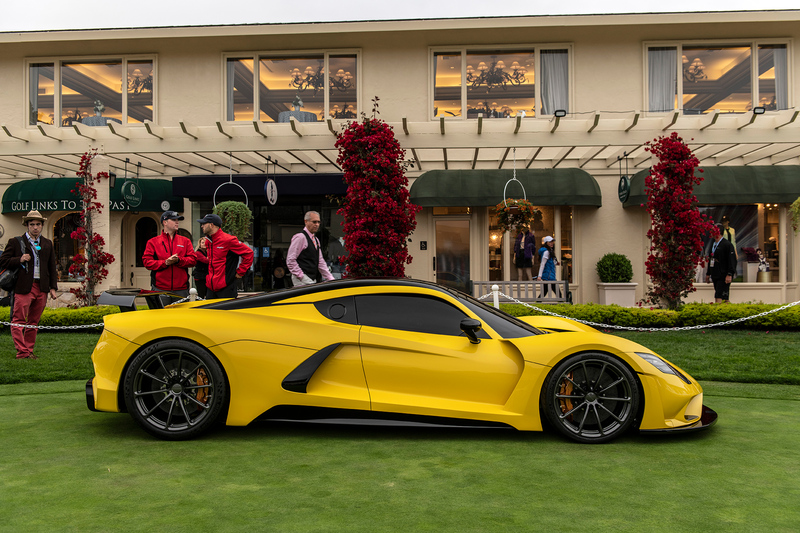 Pennzoil®. * Based on a survey of private motorists, between the ages of 18-64, who own or lease a car in the US, between January 2016 and December 2016. 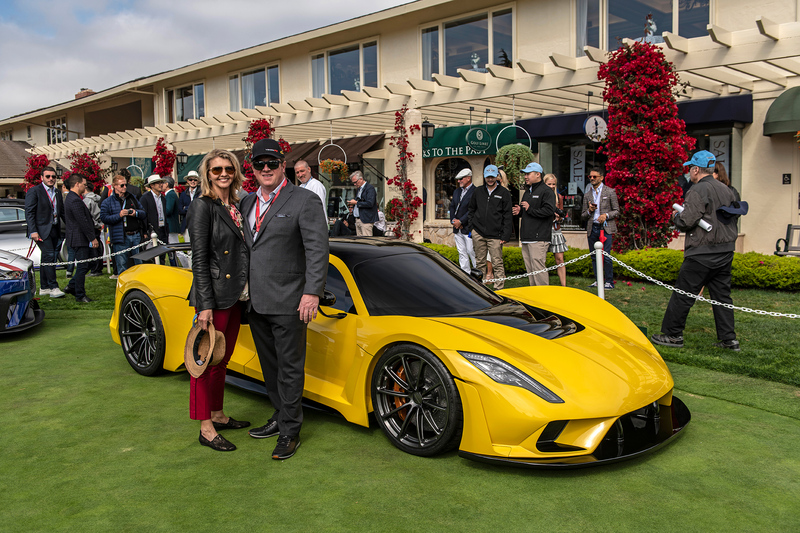 About Hennessey® Special Vehicles Hennessey Special Vehicles was established IN 2017 by John Hennessey to be a leader in the hypercar / automotive industry. About Shell Oil Company Shell Oil Company is an affiliate of the Royal Dutch Shell plc, a global group of energy and petrochemical companies with operations in more than 70 countries. We deliver a diverse range of energy solutions and petrochemicals to customers worldwide. These include transporting and trading oil and gas, marketing natural gas, producing and selling fuel for ships and planes, generating electricity and providing energy efficiency advice. We also produce and sell petrochemical building blocks to industrial customers globally, and we are investing in making renewable and lower-carbon energy sources competitive for large-scale use. In the U.S., we operate in 50 states and employ nearly 20,000 people delivering energy in a responsible manner. About Shell Oil Products US Shell is a leader in the refining, transportation and marketing of fuels with approximately 14,000 branded gasoline stations in the United States. 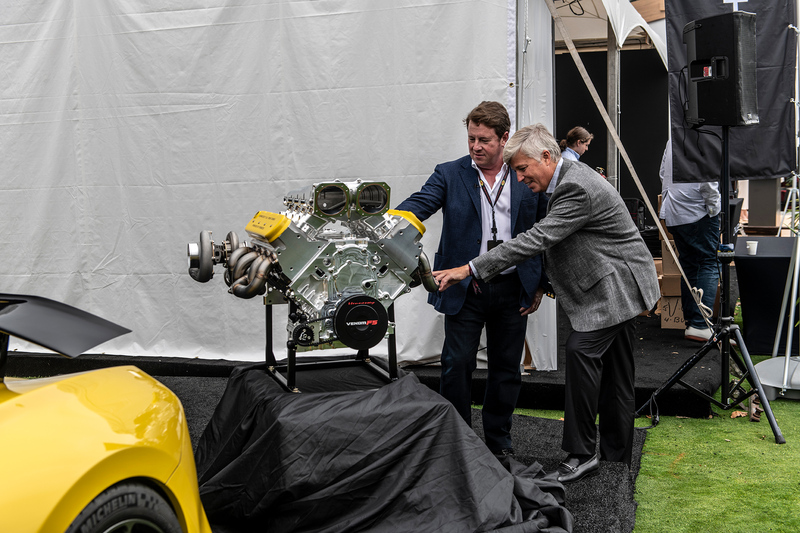 About SEMA SEMA, the Specialty Equipment Market Association founded in 1963, represents the $41.2 billion specialty automotive industry. The industry provides appearance, performance, comfort, convenience and technology products for passenger and recreational vehicles. 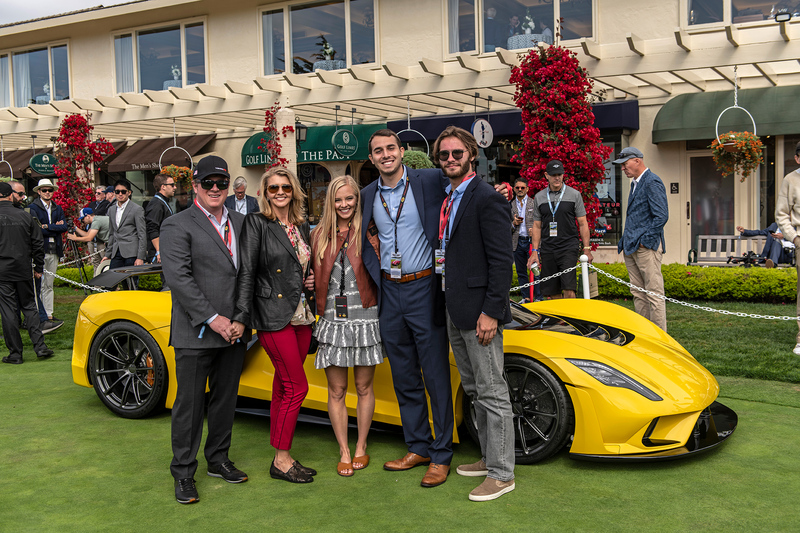 Association resources include market research, legislative advocacy, training and product development support, as well as leading trade shows such as the SEMA Show in Las Vegas, NV, and the Performance Racing Industry (PRI) Trade Show in Indianapolis, IN. 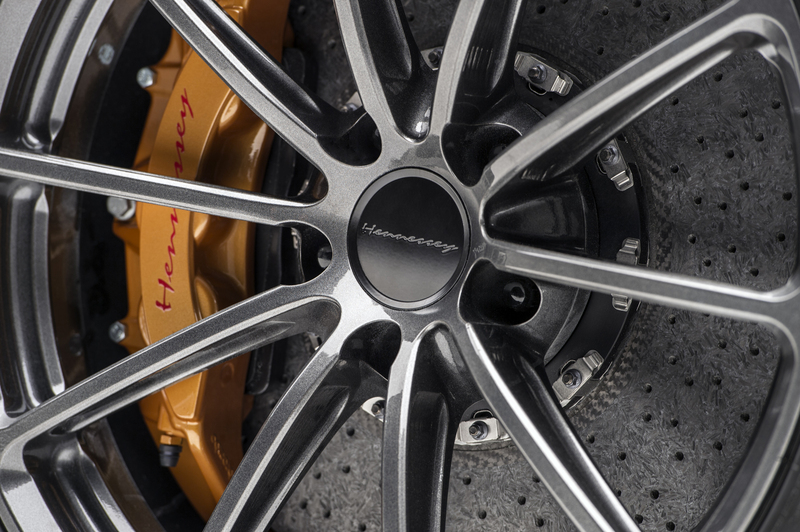 For more information, visit www.sema.org, www.semashow.com, or www.performanceracing.com.